The evening of August 22 was the last of a string of cloudy, drizzly and dark nights. 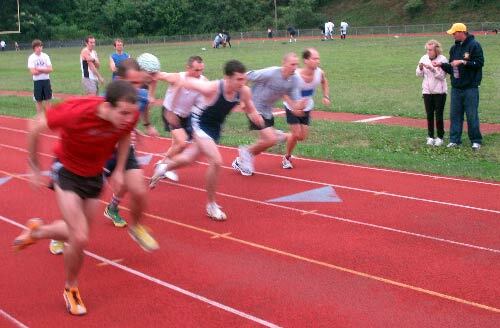 But the stars were out at the 4th Annual Wanderers All Comers Track Meet at Roxborough High School. These stars were not in the sky. 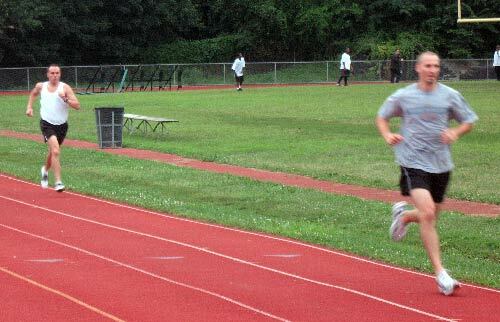 They were running around the track. It was a little hard to choose what was the best performance. 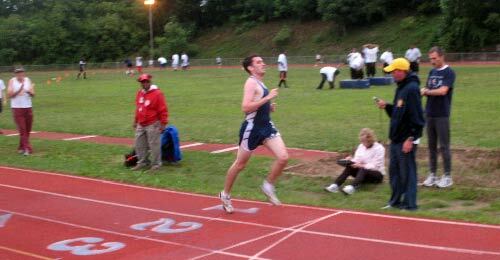 Ryan Fennely won both the mile and the 3,000 meters. Mike Carriglitto absolutely smoked a very strong field in the 5,000 meters. Meet veteran Kevin Forde displayed his national Masters championship form in the 800 winning that event, and running in countless other races as well. A.J. Lofton, who has always been a meet favorite, ran in the mile, 800 meters and 400 meters. His junior running club teammate Jordan May did one better by running in all these events plus a leg in the medley relay. Ryan Fennely started the evening off with a blistering 4:29 run to win the elite division of mile run over a strong field. Finishing second was Chris Grace in 4:38, followed by Kevin Forde in 4:48. Rounding out the strong field were All Comers Meet regulars from Center City John Wesner and Kevin Gruenfeld finishing in 5:12:5 and 5:16:6 respectively with Matt Bucklaw coming in sixth in 5:22 and John Wheeler in 7th in 5:27. 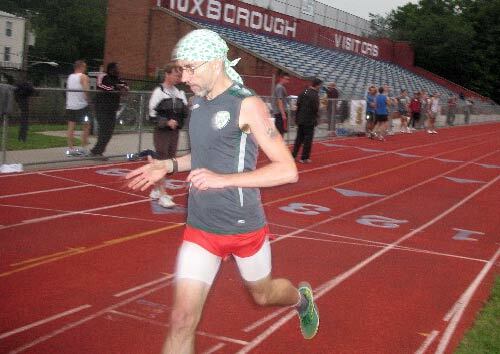 In the second heat of the mile, Chris Turk finished first in 5:35.9 followed by Bill Burnett in 5:36.6, Jordan May in 5:38, Ambler Running Club star Tom Jennings in 5:40, Wanderer Helen Cheung in 5:55, Wanderer Irene Nagle in 6:04, Heather Smith in 6:48, Jake Winters in 7:00 and A.J. Lofton in 7:46.1. William White captured the 400 meters in 55 seconds followed by Jordan May in second in 62 seconds. Daniel Greeley ran third in the same time. Fourth was John Wheeler in 68 seconds. Ilya Rakman finished 5th in 1:15, with Josh Hulbert sixth in 1:20 and A.J. Lofton seventh in 1:30. Ryan Fennelly pulled away from Neil Clark in the 3,000 meters to win in 9:19.2 with Neil finishing second in 10:36. Rounding out the field were Kate Bowser in 3rd in 11:16.5, Heather Smith in fourth in 12:06, Brian Reuter (no relation to Wanderers chef bin Reuter) in fifth in 13:49, Wanderer Dan Gordon in 14:06, and Wanderer Ken Longo in 22:32. Kevin Forde, fresh off a victory earlier in the month in the Masters 800 in the 40-45 division, stormed to victory in the Wanderers 800 in a time of 2:04.5. Chris Grace ran second in 2:08.7, Ryan Doyle came in third in 2:24.1. Tom Jennings took fourth in 2:37 followed by Jordan May who nipped Josh Hulbert for fifth. 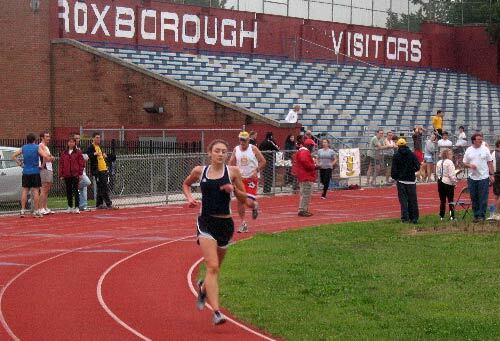 Irene Nagle placed seventh in 2:44.9, while Will White held off Jake Winters for eight in 2:57 and A.J. Lofton ran 10th in 3:23. Mike Carriglitto was simply too strong in the 5,000 meters winning in 15:52.44. Rob Shiff ran a super 17:19 to finish second in his first performance as a Wanderer. John Wesner finished third in 18:56 followed by Chris Turk in 19:13, John Wheeler in 19:22; Bill Burnett in 20:22 and Ilya Rakhman in 21:30. Almost everyone got in the act for the medley relay with the Drexel University team taking the title in 12:36.19. Certainly another star performer at the track meet was chef Jan bin Reuter who served up his trademark beef brisket and pulled pork. He received rave reviews from meet participants. 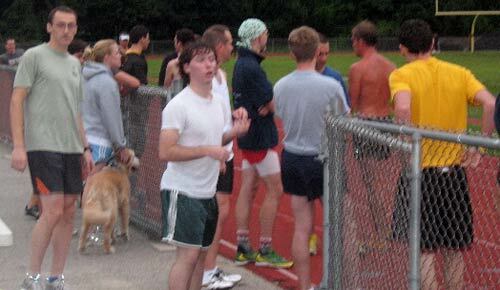 Race director Chris Moore had the meet running like clockwork with great support from Bob Reynolds and Chris Verry. Lola and Melanie Wright did a great job at the registration table and did not abscond with the cash box at the end of the meet. 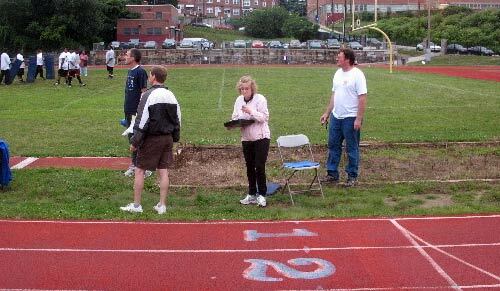 Jim Trainor, Fred Kenney, Polly Jansen and Pat Barrett brought food, helped out and generally took care of business for the Wanderers at the meet. It was a lot of fun! the registration desk as runners sign up. 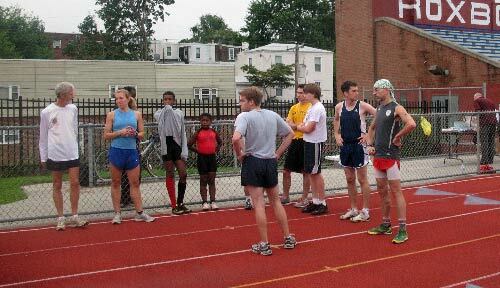 Milers get their instructions from race direcor Chris Moore. 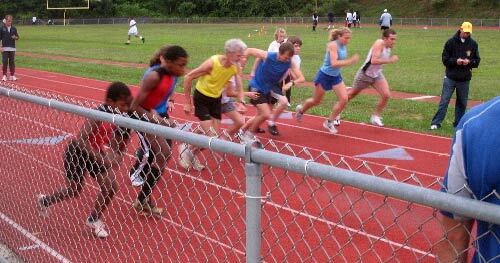 They're off in the Elite division of the mile run. they speed by timekeepers Bob Reynolds and Chris Verry. Matt Bucklow and John Wheeler battle it out for sixth. Ryan Fennely hits tape to win the elite division of the mile. The second heat is off! 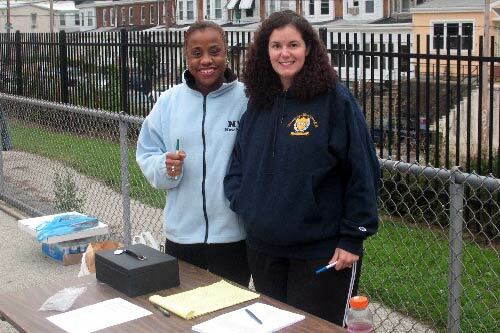 cash box and did a great job registering runners. 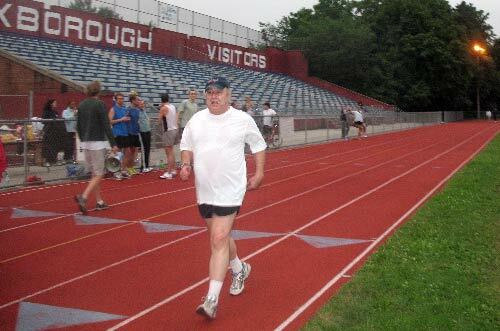 the mile followed closely by Bill Burnett. Wanderers Helen Cheung and Irene Nagle looked strong at the finish. Pat Barrett made sure there were no screw-ups at the finish line! Dan Gordon hangs on for dear life in the 3K! Kathryn Bower was the top women's finisher in the 3K. 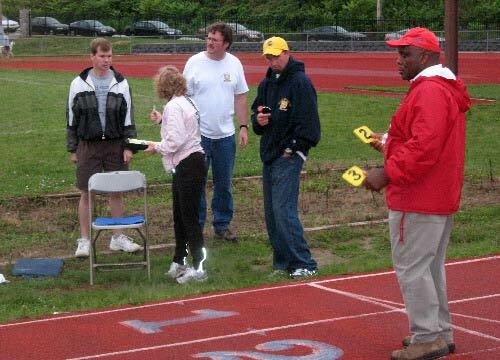 Jonas Hardin, in the red jacket, started the races and was lap counter as well. A strong contingent of Drexel University runners showed up for the meet. Runners await the start of the 800 meters. 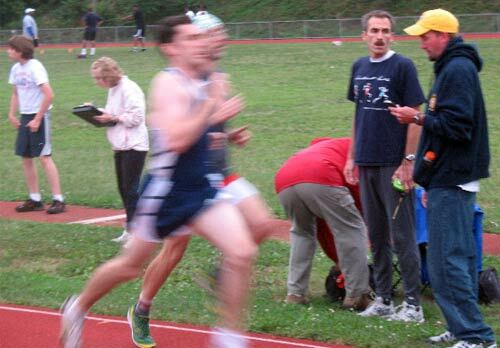 Wanderer Ken Longo wraps up a great 3,000 meter performance. with Tom Jennings and Irene Nagle in hot pursuit.